Twenty years ago the Las Vegas dining scene was all about the cheap buffet and 24-hour coffee shops. Lucky for us, the city has evolved into a major culinary destination with some of the top restaurants in the world. It all started when Wolfgang Puck brought Spago to Las Vegas in 1992. After its success, people started taking the culinary scene in Las Vegas a little more seriously and dozens of celebrity chefs followed suit. Today, Las Vegas is home to countless restaurants by famous chefs from around the world, serving every type of cuisine imaginable. You might know some of them from popular food TV shows or if you’re a serious foodie you might just know them as award-winning and highly acclaimed chefs. In fact, there are so many celebrity chef restaurants in Las Vegas we almost ran out of paper when we started writing them all down. To help you keep track of them all we put together a handy (alphabetical) list to show you where you can find them and what kind of food you can expect from their Las Vegas restaurants. Awards: Andrés was named Chef of the Year by “Bon Appétit” in 2004 and Outstanding Chef by the James Beard Foundation in 2011. Where you can find his food in Las Vegas: You can taste true Spanish tapas at Jaleo at The Cosmopolitan of Las Vegas. Andrés combines authentic Chinese and Mexican flavors under one roof at China Poblano at The Cosmopolitan. 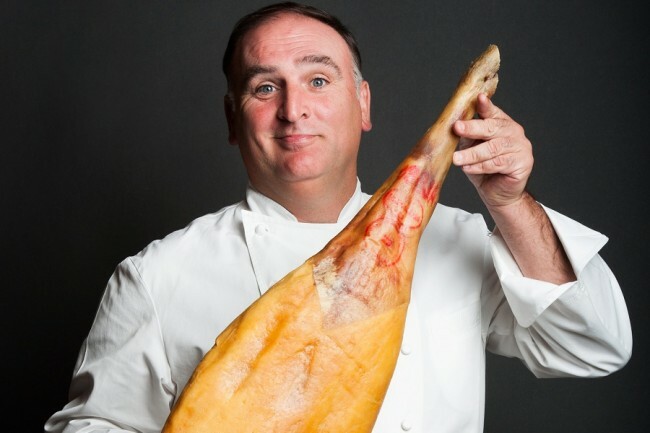 His restaurant, Bazaar Meat by José Andrés, at the SLS Hotel celebrates all things carnivorous. Awards: Batali was named Best Chef: New York City from the James Beard Foundation in 2002 and in 2005 the James Beard Foundation awarded him Outstanding Chef of the Year. Where you can find his food in Las Vegas: In Las Vegas you can find Batali’s delectable Italian cuisine at Otto Enoteca Pizzeria and B&B Ristorante at the Venetian, amazing steaks at Carnevino at the Palazzo and more casual fare and burgers at B&B Burger & Beer at the Venetian. 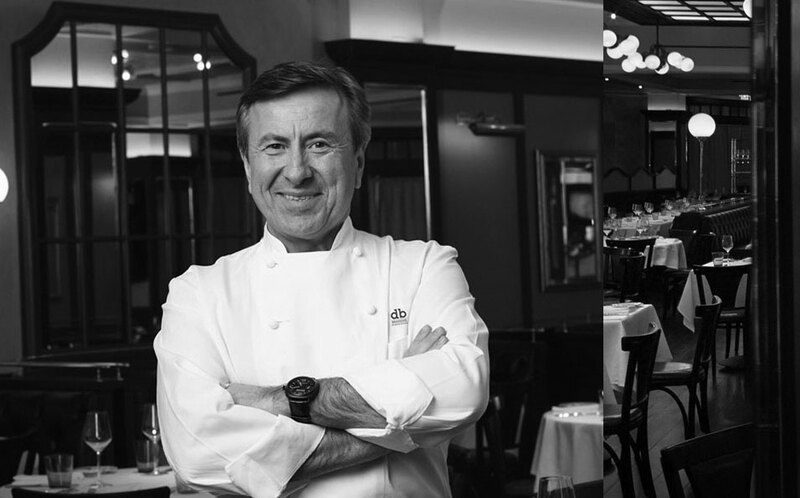 Why you know him: French chef Daniel Boulud is the chef and owner of several award-winning restaurants and the Feast & Fêtes catering company. His renowned New York restaurants have made him a leading culinary authority in the U.S. and he has written eight cookbooks. Where you can find his food in Las Vegas: You can taste Boulud’s French contemporary fare at db Brasserie at the Venetian. Awards: Conant was nominated for the James Beard Foundation’s Best Chef New York in 2005. Scarpetta in New York was nominated for Best New Restaurant by the James Beard Foundation in 2009. Where you can find his food in Las Vegas: Conant has two Italian restaurants in Las Vegas at The Cosmopolitan. Try Scarpetta for his famous spaghetti or head to his wine and pizza restaurant D.O.C.G. Awards: He was the winner of the 2010 Outstanding Chef award from the James Beard Foundation. Where you can find his food in Las Vegas: Steak fans will love his two restaurants in Las Vegas. Craftsteak at the MGM Grand serves prime cuts of grain and grass-fed beef and Heritage Steak at The Mirage focuses on meats prepared over an open flame on wood-burning ovens and charcoal grills. Why you know her: Italian chef Giada De Laurentiis has starred in many shows on Food Network and is also a correspondent on NBC’s “Today.” She is the author of six cookbooks, all of which have charted on the New York Times best-seller list. Awards: She has won the Daytime Emmy Award for Outstanding Lifestyle Host and has been inducted into the Culinary Hall of Fame. Where you can find her food in Las Vegas: De Laurentiis opened her first restaurant at The Cromwell last year. Her restaurant, called Giada embraces her passion for Italian cooking with lighter California influences. Awards: He runs several restaurants and is only one of two chefs to hold 21 Michelin stars throughout his career. In 2013 he was awarded the Lifetime Achievement on The World’s 50 Best Restaurants List produced by British magazine “Restaurant,” based on a poll of chefs, restaurateurs, gourmands and critics. Where you can find his food in Las Vegas: Ducasse’s restaurant Mix at the Delano will shutter later this month to be remodeled into a new concept called Rivea, which will serve French and Italian cuisine. Why you know him: American chef Todd English is known for his restaurant, Olives, located in both Boston and Las Vegas, plus his TV cooking show, “Food Trip with Todd English,” on PBS. In 2005 he was a judge on the PBS show “Cooking Under Fire.” English has also written several cookbooks and has his own cookware line, the Todd English Collection. Awards: In 1991 the James Beard Foundation named him their National Rising Star Chef. In 1994 James Beard Foundation named him Best Chef in the Northeast. “Nation’s Restaurant News” named English one of their Top 50 Tastemakers in 1999. In 2001, English was awarded “Bon Appétit’s” Restaurateur of the Year award. Where you can find his food in Las Vegas: At Olives at Bellagio, you can sample English’s Mediterranean fare including pastas, pizzas and steaks. English also runs Todd English P.U.B. at Crystals at CityCenter. The restaurant serves modern interpretations of traditional pub fare. 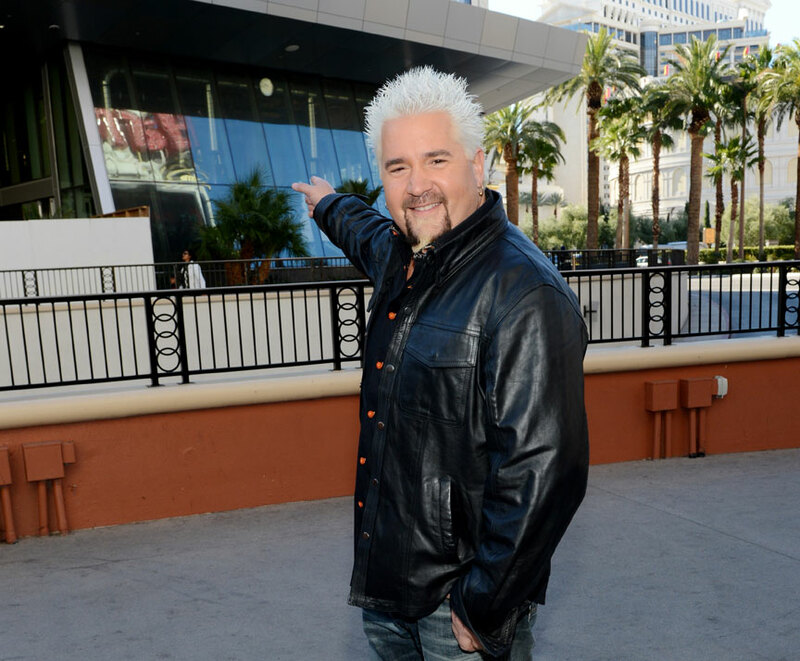 Why you know him: Guy Fieri is a bit of a local Las Vegas celebrity chef — he graduated from UNLV in 1990. In 2006, he premiered his first show, “Guy’s Big Bite” on Food Network. He hosts “Diners, Drive-Ins and Dives” and “Tailgate Warriors” as well as guest judges on “Food Network Star.” Fieri is the chef at six restaurants. Awards: Fieri won the second season of “The Next Food Network Star.” He is a New York Times best-selling cookbook author. Where you can find his food in Las Vegas: His first Las Vegas restaurant, Guy Fieri’s Kitchen and Bar at The LINQ Hotel & Casino serves a variety of food including tacos, Guy’s Fireball Wings and his famous Vegas Fries with Buffalo seasoning, blue cheese, celery and carrots. Awards: Flay was named the James Beard Foundation’s Rising Star Chef of the Year in 1993 and was named to the James Beard Foundation’s Who’s Who of Food & Beverage in America in 2007. Where you can find his food in Las Vegas: You can dine at Flay’s Mesa Grill at Caesars Palace, which serves contemporary Southwestern-style food, or at Bobby’s Burger Palace at Crystals at CityCenter, which is a fast-casual burger concept serving unique burgers and sides. Awards: In 2009, Gagnaire made his United States debut with Twist restaurant at the Mandarin Oriental in Las Vegas, which has received a Forbes Five-Star Award. Where you can find his food in Las Vegas: Twist is the only place in the U.S. where you can indulge in Gagnaire’s contemporary French cuisine. Twist offers a choice of seasonal à la carte dishes as well as a three-course or six-course tasting menu. 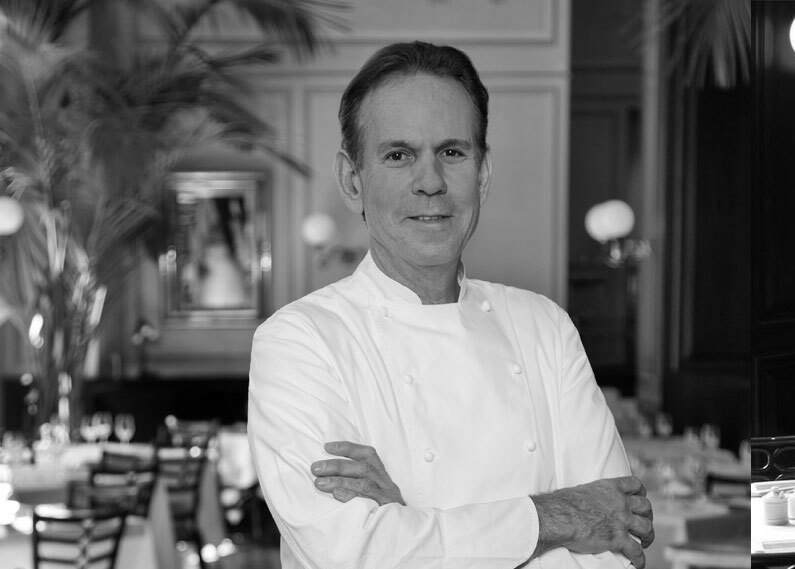 Awards: In 1988 Keller was ranked as one of the 10 Best New Chefs in America by “Food & Wine Magazine.” In 1997 he won the James Beard Foundation/Perrier-Jouët award for America’s Best Chef in California. Keller was also named to the James Beard Foundation’s Who’s Who of Food and Beverage. Where you can find his food in Las Vegas: You can taste Keller’s cuisine at Fleur and Burger Bar at Mandalay Bay. Fleur features small plates from around the world including Thailand, China, the U.S., France and Spain. Burger Bar serves the finest varieties of beef, buffalo, turkey and vegetarian burgers. Why you know him: Keller is an acclaimed American chef, restaurateur, and cookbook writer. Awards: He and his famous Napa Valley restaurant, The French Laundry in Yountville, California, have won multiple awards from the James Beard Foundation, including the Best California Chef in 1996, and the Best Chef in America in 1997. In 2001, Keller was named America’s Best Chef by “Time” magazine. 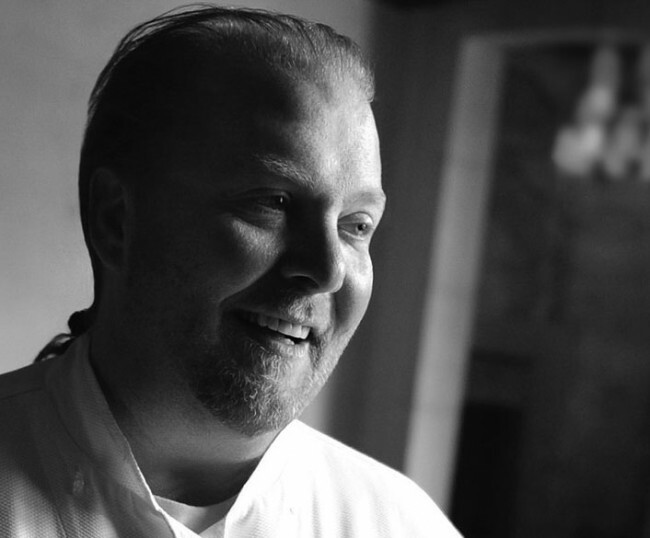 Keller is the only American-born chef to hold multiple three star ratings by the Michelin Guide, having received a total of seven stars in the 2011 editions. Where you can find his food in Las Vegas: You can sample Keller’s cuisine at Bouchon and Bouchon Bakery at the Venetian. Bouchon is a French restaurant serving traditional bistro fare as well as a raw bar with fresh seafood. The bakery offers sweet and savory concoctions including croissants, tarts, chocolates and macarons. Awards: Lagasse was named Best Southeast Regional Chef by the James Beard Foundation in 1991. He was named Chef of the Year by “GQ Magazine” in 1998 and was inducted into the Culinary Hall of Fame in 2013. Where you can find his food in Las Vegas: He has several restaurants around Las Vegas including Emeril’s New Orleans Fish House at MGM Grand, which serves Cajun and seafood dishes, Delmonico Steakhouse at the Venetian and Table 10 and Lagasse’s Stadium at the Palazzo. Table 10 serves Cajun and Creole fare and Lagasse’s Stadium features the chef’s take on traditional American sports bar food. Where you can find their food in Las Vegas: Mary Sue and Susan are known for their authentic Mexican cuisine and are co-chef/owners of the critically acclaimed Border Grill Mexican restaurants in Las Vegas at Mandalay Bay Resort & Casino and the Forum Shops at Caesars. Awards: Mina has won many accolades. He was named “Wine Enthusiast Magazine” Restaurateur of the Year in 2012; “Bon Appétit’s” Chef of the Year for Michael Mina Bellagio in 2005 and the James Beard Foundation Best Chef in 2002. Where you can find his food in Las Vegas: Mina offers several restaurant choices in Las Vegas including the new Bardot Brasserie French restaurant at Aria. His namesake restaurant, Michael Mina, serves seafood and American food at Bellagio, and Pub 1842 at MGM Grand serves beer and pub favorites. Meat lovers will also appreciate the modern steakhouse fare at Stripsteak at Mandalay Bay. Awards: Moonen was given the 1993 Chef of the Year Award for the Northeast Region from Chefs in America. Where you can find his food in Las Vegas: Moonen’s Las Vegas restaurants include RM Seafood and RX Boiler Room, which is a steampunk-inspired restaurant and lounge showcasing Moonen’s spin on comfort food and handcrafted cocktails. 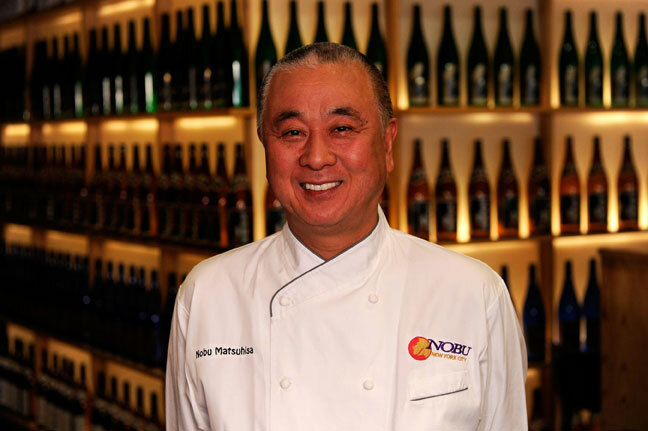 Why you know him: Known simply as Nobu, this famous Japanese chef opened Matsuhisa in Beverly Hills in 1987. He partnered with Robert De Niro and Meir Teper in 1994 to open Nobu Tribeca in New York City. He has since opened many more Nobu restaurants worldwide. Awards: Nobu in New York was named The Best New Restaurant by The James Beard Foundation in 1995. He was nominated for Outstanding Chef by the James Beard Foundation nine times. Where you can find his food in Las Vegas: Nobu has two restaurants in Vegas where you can dine on fine Japanese food and sushi – at the Hard Rock Hotel and at Caesars Palace. Nobu is also a partner in the Nobu Hotel at Caesars Palace. Why you know him: Charlie Palmer was one of 16 chefs honored in the Julia Child PBS series, “Cooking with Master Chefs,” and is featured in the cookbook that followed the series. He has also authored four cookbooks. He has been a frequent guest on the “Today” show. Awards: He was named New York’s Best Chef in 1997 by the James Beard Foundation. In 2011 Palmer was appointed the Chairman of the Board of the Culinary Institute of America. Where you can find his food in Las Vegas: Diners in Las Vegas can visit his restaurant Aureole at Mandalay Bay, which features seasonal dishes including dry-aged beef and fresh seafood. The restaurant received one Michelin star in 2007, 2008 and 2009. He also runs Charlie Palmer Steak at the Four Seasons at Mandalay Bay, a restaurant offering steak and seafood favorites. Why you know him: This celebrated French pastry chef has several shops around the world and is the author of several popular cookbooks. Awards: Payard was the 1995 recipient of the James Beard Foundation Pastry Chef of the Year award, honoring him for his unique pastry designs and flavors. He was named Pastry Chef of the Year by the “Bon Appétit” Food & Entertainment Awards and again in 2001 by the International Pastry Competition Committee-Beaver Creek. In July of 2004, the French government honored him with the Ordre du Mérite Agricole, Medal of Honor. Where you can find his food in Las Vegas: You can find his sweet concoctions at his pastry shop at Caesars Palace. There is also a bistro adjacent to the pastry shop where you’ll find Payard’s signature sandwiches, and French-inspired breakfast and lunch items. Why you know him: Wolfgang Puck owns several restaurants, has written cookbooks and is the official caterer for the Academy Awards Governors Ball. He has appeared in several TV shows and films and has been on “Iron Chef America: Battle of the Masters,” as well as “Cooking Class with Wolfgang Puck” on the Food Network. Awards: Puck won the James Beard Foundation Award for Outstanding Chef of the Year, twice, in 1991 and 1998. He is the only chef to have won the Outstanding Chef of the Year Award two times. Where you can find his food in Las Vegas: Wolfgang Puck is often credited with starting the celebrity chef craze in Las Vegas with the opening of Spago at the Forum Shops at Caesars back in 1992. His Las Vegas restaurant empire now includes Spago, Cut, a steakhouse at the Palazzo, Trattoria del Lupo Italian restaurant at Mandalay Bay, Wolfgang Puck Pizzeria & Cucina at CityCenter and two outlets of Wolfgang Puck Bar & Grill casual eatery at MGM Grand and at the local Downtown Summerlin outdoor mall. 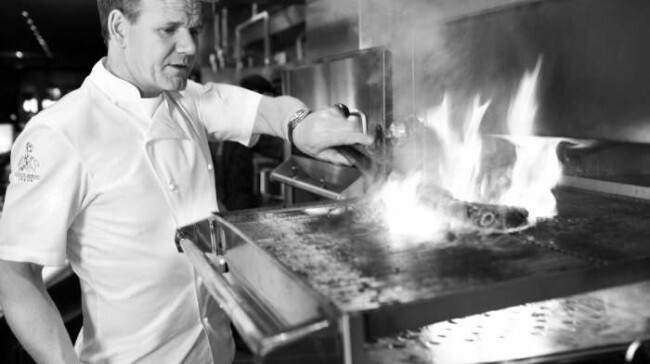 Awards: Restaurant Gordon Ramsay was Ramsay’s first solo restaurant, located in London. In 2001, it was voted Top Restaurant in the U.K. in the London Zagat Survey and was awarded its third Michelin star, making Gordon Ramsay the first Scottish chef to win three Michelin stars. Where you can find his food in Las Vegas: In Las Vegas, Ramsay has three restaurants — Gordon Ramsay Steak at Paris Las Vegas, Gordon Ramsay BurGR at Planet Hollywood and Gordon Ramsay Pub & Grill at Caesars Palace. Ramsay will soon be opening his fourth restaurant in town, Gordon Ramsay Fish & Chips at the LINQ Promenade. Why you know him: Joël Robuchon was given the title “Chef of the Century” by the guide Gault Millau (one of the most influential French restaurant guides) in 1989. He has published several cookbooks in French, two of which have been translated into English, and has hosted culinary television shows in France. Awards: He operates restaurants in Hong Kong, London, Macau, Monaco, Paris, Taipei and Tokyo, with a total of 28 Michelin Guide stars among them – the most of any chef in the world. Where you can find his food in Las Vegas: The only place in the United States where you’ll find one of his restaurants is in Las Vegas at the MGM Grand. There are two dining experiences available — Joël Robuchon and L’Atelier de Joël Robuchon. Joël Robuchon offers a six-course menu and a 16-course menu. There are also special tasting menus. At L’Atelier is a more casual restaurant featuring a selection of small plates and entrees. Why you know him: Guy Savoy is a world-renowned French chef who owns the Guy Savoy restaurants in Paris and in Las Vegas at Caesars Palace. Where you can find his food in Las Vegas: At Restaurant Guy Savoy at Caesars Palace, guests will be treated to French dishes including Savoy’s famous artichoke and black truffle soup, French sea bass, pan seared quail, whole roasted duck and more. Why you know him: Spanish chef Julian Serrano is a graduate of the Escuela Gastronomie P.P.O. hotel management school in Marbella, Spain, and has pursued his passion for French cuisine in some of Europe’s most acclaimed kitchens. Awards: Serrano is a two-time winner of the James Beard Foundation Award (Best Chef Pacific 1998 & Best Chef Southwest 2002). Where you can find his food in Las Vegas: In 1998, Serrano brought his Mediterranean-­French cooking to Bellagio at Picasso restaurant. The Michelin two-star restaurant has won the AAA Five Diamond Award every year since 2002 and its wine list has received the Grand Award from “Wine Spectator” magazine. The chef also serves Spanish-style tapas at his Julian Serrano restaurant at Aria and Italian small dishes at Lago at Bellagio. Awards: In 2002, the now-closed Simon Kitchen & Bar at the Hard Rock Hotel and Casino was selected as one of America’s Best New Restaurants by “Esquire” magazine. Where you can find his food in Las Vegas: Simon’s latest venture is the popular Carson Kitchen in Downtown Las Vegas. The restaurant serves small plates with creative twists on American food. Why you know him: Masayoshi “Masa” Takayama is one of the most famous sushi chefs in the U.S. Awards: He is the chef and owner of Masa Japanese and sushi restaurant in New York City, which has won three Michelin stars. Where you can find his food in Las Vegas: Masa owns Bar Masa at Aria in Las Vegas. The restaurant uses fish that have been out of Japan’s coastal waters for no more than 24 hours. Why you know him: Buddy Valastro is an Italian American celebrity chef, entrepreneur, and reality television personality. He is best known as the star of the reality television series “Cake Boss.” He is also the host of the show’s spin-off, “Kitchen Boss,” as well as “Next Great Baker” and “Bakery Boss.” He serves as head baker at Carlo’s Bakery in Hoboken, N.J. Awards: In January 2012, the “Hudson Reporter” named Valastro as an honorable mention in its list of Hudson County’s 50 most influential people. 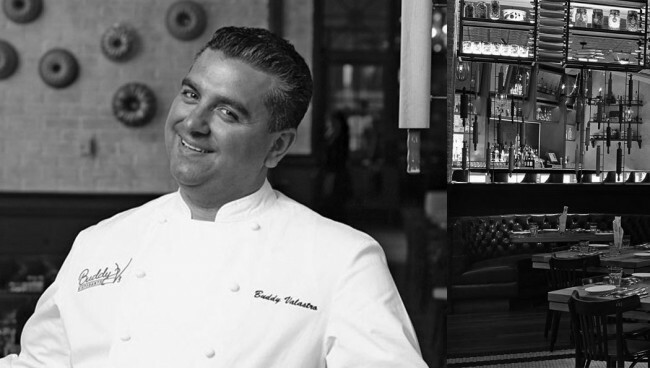 Where you can find his food in Las Vegas: In Las Vegas, Valastro has an Italian restaurant, Buddy V’s at the Venetian, which features family recipes, and a branch of Carlo’s Bakery next door. Why you know him: Jean-Georges Vongerichten is the author of five cookbooks. In 1986 he arrived in New York to take over the executive chef position at Lafayette in the Drake Swissôtel, generating critical acclaim and earning four stars from “The New York Times” at the age of 29. Awards: Vongerichten and Phil Suarez opened a bistro, JoJo, in 1991. JoJo was named Best New Restaurant of the Year, and earned three stars from “The New York Times.” In 1997 he opened Jean-Georges restaurant in the Trump International Hotel and Tower, earning a four star review from “The New York Times” less than three months after opening, and the Chef of the Year Award from John Mariani at “Esquire.” Jean-Georges Restaurant remains one of seven restaurants in the city awarded three stars by the Michelin Guide. Where you can find his food in Las Vegas: In Las Vegas, you can find his cuisine at Prime Steakhouse at the Bellagio and Jean-Georges Steakhouse at Aria.